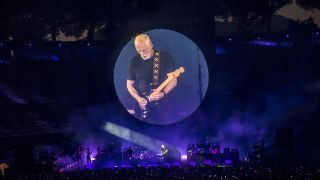 David Gilmour, Pink Floyd frontman and guitarist, is putting 120 guitars up for sale, including the most famous, his black Stratocaster. The Black Strat was Gilmour's go-to live and recording guitar from 1970, and he deployed it both live - including at Pink Floyd's famous Pompeii return, above and below - and to iconic effect on such recordings as Comfortably Numb, Money and many, many more. Such is the personally modded guitar's significance to Floyd fans, there's even a book entirely dedicated to its recorded output. Hosts Christie's auction house estimates it will sell for between $100,000 and $150,000, which seems a little light to us. Also up for sale in The David Gilmour Guitar Collection in London this summer are the 12-string on which he wrote Wish You Were Here, his white 1954 Stratocaster - serial number #0001! - featured on Another Brick in the Wall, and the Novation six-string that Gilmour uses for live renditions of Comfortably Numb. GIlmour spoke to Rolling Stone about the sale. “These guitars have been very good to me,” he said. “They’re my friends. They have given me lots of music. I just think it’s time that they went off and served someone else. Of the Black Strat, he states, "It’s on so much stuff, but Fender have made replica ones that they sell, and I have two or three of those that are absolutely perfect. One of those might be my future guitar of choice or even, horror of horror, maybe I’ll even change the colour." Specifically, the sales proceeds will go to Gilmour’s charitable foundation. “The money will be going to the larger needs of famine relief, homelessness and displacement of people throughout the world." For much more on the sale, check out Rolling Stone's Q&A or head over to the Christie's auction site.